PLR Brainstorm - Powerful Ideas to Turn PLR Into Profits! Learn the simple, easy to understand system for creating high demand private label rights products with the plr brainstorm video series. If you said yes to any of the above, then this may very well be one of the most important letters that will reveal to you how you can save money and save time producing unique and high in demand products! You can make money on the Internet through many avenues but creating your own product that solves a problem, yet helps your customers, is a great way to make money online. What may scare you is you don’t know where to start or you don’t know what type of digital product you should create. Worry no more because all those answers and many more will be answered here alone. This system is so easy to follow that even newbies will find it incredibly simple. That means if you’ve never created a product in your life, you’ll walk away knowing how to do just that with this video series. There’s no secret here. In fact it’s all about using existing Private Label Rights Products and making them into your own product. You see with the PLR craze, there are so many digital products coming out on the market which you can make your own or even better, add your own ideas on to of them. Don’t know what Private Label Rights Products are? PLR products are the fastest way to develop your own products and save hours of trying to start one. Whether the product is an article, ebook, audio article / ebook, video, or software, the best part is that you don’t have to create the original idea, but you can add onto it! You simply purchase the Private Label rights to author that gives these rights! PLR products allow you to start with an idea and add onto it so you don’t have to spend countless hours banging your head on the wall. 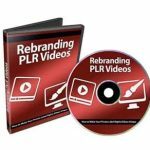 BIGGEST PROBLEM: People stamp their name on a PLR product and sell it. By doing that, the full potential of the PLR product is not being used. If you’re just the same as 1000’s of other people out there that are doing the same thing, then your profits are going to be high and you’ll end up wondering why your profits aren’t what they could be. There is a small percentage of people that take an extra step and make more money than the other crowd. The question is how can you be part of this small percentage? The importance of creating sellable products is how they solve a common problem and how unique they are. The answer is to change the PLR product so dramatically that it looks nothing like the original and has many features added onto it that it sells many times more. Use PLR as the “mid point”, not the ending point. It’s just the beginning and the PLR product has helped you jump over the starting point. This video series takes you by the hand, step by step, click by click to creating a great product that not only sells, but increases your profit by several times more! One the biggest problems you may run into during product creation is you don’t know where to start, you have writer’s block, or idea block. Or you don’t have enough time and money. This where we will talk about how you can use Private Label Content and turn them into unique products. As I mentioned earlier, most people will take PLR products and stamp their name on it. This video series will reveal to you ideas that you can use to stand out of the crowd. You’ll also learn the tools you need before watching the following videos. Private Label Articles is by far the most popular type of Private Label Product out there, simply because articles are shorter, easier to create, and more widely available. Instead of just stamping your name on a PLR article, there many ideas that you’ll learn in this video to reshaping PLR articles into different forms that will increase your product and sell value. Private Label Ebooks are the next widely available type of PLR product because it is written. Since ebooks are larger, you can generally do a lot more with them when you reshape them into different product formats. In this video you’ll learn how to do just that and much more. Once you can grasp the main concept of the ebook, you’ll understand how to easily make them unique. It doesn’t matter if 1000 other people have PLR to the same ebook, you’ll learn how to stand out from the crowd. In this video, we won’t be going over just the basics, you’ll learn many neat out of the box ideas that most people will not even think about that we’ll talk about in this video. By using these ideas, you’ll be ahead of the crowd. When you get Private Label Rights to videos, most people will resell them. But what good does that do when 100’s of other people are doing the same thing? It is not hard at all to rebrand videos, add audio, add and remove video clips, and more. You’ll learn how to do that and you’ll learn new ideas that’ll allow you to think outside the box to reshape videos into other product forms. It doesn’t matter if you have ZERO amount of knowledge on how to write software code. In this video, you’ll learn how to gain access to a Private Label Source Code and take it to the next level. While others may resell it without even stamping their names on it the source code, you’ll be learning how to add features and remove features without even touching the program. You’ll learn tricks and tips to keeping your costs down when you hire programmers to change your software. You’ll also learn how to keep yourself safe when you hire someone that you don’t even know. …and who cares if it’s 3am on my end of the world. You can access these videos immediately after your purchase. There’s simply no waiting.